This page provides best estimates, at the time of the Call for Proposals, of instrument availability and target (RA, dec) restrictions for 2013A. As there are more instruments than the number of ports on each telescope, instrument swaps will be required and not all instruments will be available for the entire semester. When possible instrument swaps will be scheduled to minimize impact on the queue and instrument swaps will be driven by demand. It may be the case that certain targets or entire programs will not be feasible once the final schedule is determined, at ITAC or thereafter. If an instrument is requested for less than 6% of the Bands 1+2 time, the Observatory reserves the right to limit the RA range available to programs, or to not schedule the instrument. Instrument changes are not permitted during classical runs. All instruments are restricted for sky visibility as described in the Table and Figure below. GNIRS will be removed at the end of the semester for a lens replacement; although the exact date will be driven by demand, applicants with targets at RA 22h to 1h are advised to have backup targets available at earlier RA. Observations requiring the Laser Guide Star (LGS) system are further restricted by the limitation that the LGS must be used at or above 40 degrees elevation. How this translates into RA and dec restrictions is indicated in the Table. Michelle is not offered in 2013A. 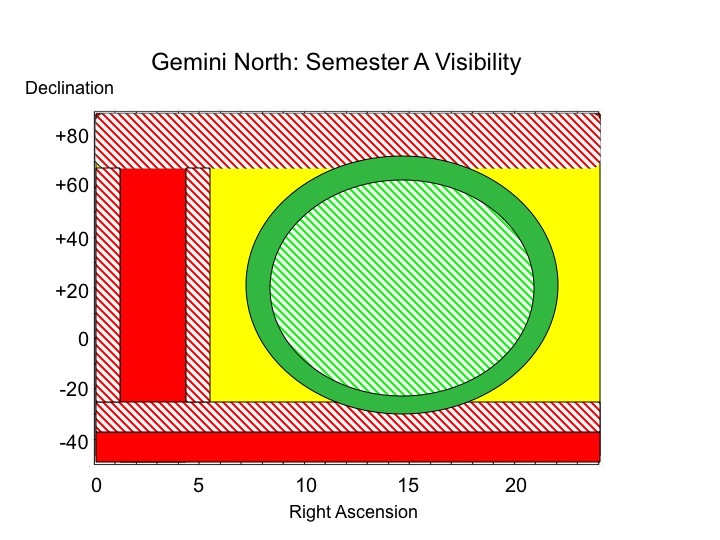 Figure 1: Schematic representation of target accessibility at Gemini North during semester 2013A. Green regions offer unrestricted access, red regions are inaccessible. Hatched areas indicate the more restricted LGS regions. The yellow region is possible, but restricted. See text, and values in the Table above. All instruments are restricted for sky visibility as described in the Table and Figure below. FLAMINGOS-2 will be available for System Verification only, via a separate call. Observations using GeMS are restricted to greater than 45 degrees elevation. GSAOI + GeMS is expected to be available for early science from February to April 2013, pending successful System Verification during 2012B. The RA and dec restrictions for GSAOI + GeMS are indicated in the Table. GMOS-South may be removed at the end of the semester for replacement of the CCDs; although the exact date will be driven by demand, applicants with targets at RA 0h to 2h are advised to have backup targets available. No restrictions have been placed on the availability of NICI , however this will be impacted by the commissioning of FLAMINGOS-2 , which will have priority. Note that 2013A is likely to be the last A semester, and probably the last semester, that NICI will be offered. T-ReCS is not offered in 2013A. 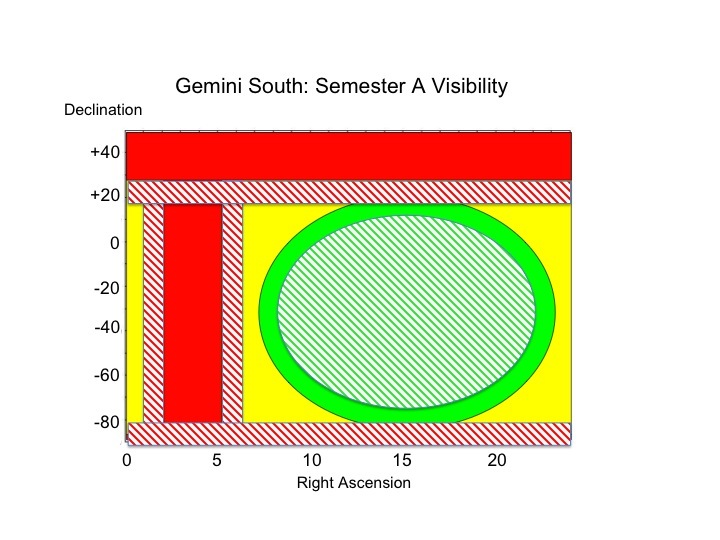 Figure 2: Schematic representation of target accessibility at Gemini South during semester 2013A. Green regions offer unrestricted access, red regions are inaccessible. Hatched areas indicate the more restricted GeMS regions (note that the limited availability of GSAOI in 13A further restricts the GSAOI + GeMS combination). The yellow region is possible, but restricted. See text, and values in the Table above.